bichonpawz: Good Thing We Didn't Decide to Move to the Cottage! Good Thing We Didn't Decide to Move to the Cottage! ALBANY, N.Y. (AP) -- A spring storm in northern New York and New England has dumped more than a foot of snow in some areas. Some of the heaviest-hit places are in Vermont. The National Weather Service says North Underhill received more than 13 inches of snow by early Wednesday and Jericho had 12 inches. The snow began falling Tuesday morning. 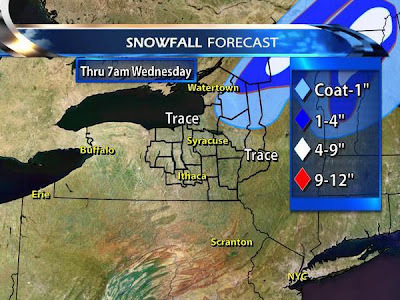 It's expected to continue through Wednesday morning. Albany, N.Y., weather service meteorologist Kevin Lipton says such snowfall is uncommon this time of year. But he says he remembers a significant snowfall around mid-May in 2002. Oh, looks like the crazy weather we had last Friday is headed your way. Stay safe! Wow...crazy weather! It does look pretty with the tulips peeking through though. Ohhh Noooooo! That's a sucky surprise for Spring. Oooooh. I hope you like snow. 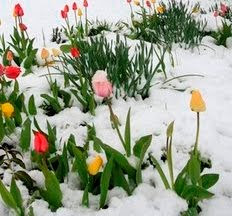 I will say, those tulips popping through the snow are beautiful. Or do I have that backwards? They are surviving the snow and continue to stand? Yep! We are under a severe winter warning right now. We are expecting 10cm overnight and most of it very heavy snow. Oh how I love spring in Alberta! Can't we outlaw snow????? we should! tomorrow.. just don't hate me.. I hope the wind stops and we have sunshine tomorrow. I wanna go bird watching. 13 inches of snow.. whew... I guess I won't complain about the wind & rain.